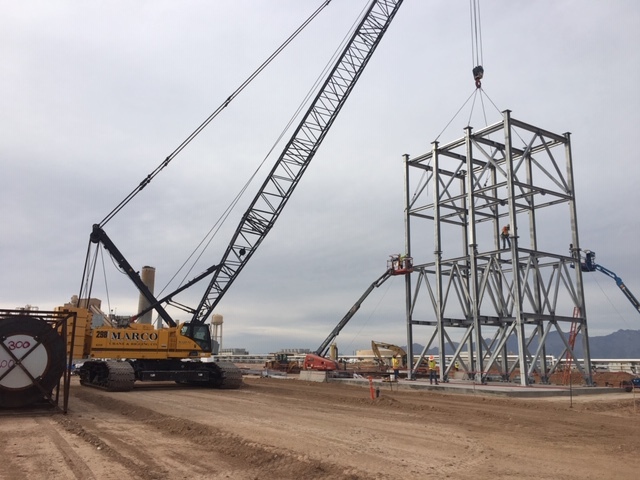 In partnership with Ashton Companies, J.B. Steel has begun erecting two (2) new 144 foot steel towers for the TEP Sundt Generating Station. To improve the safety of our workers and to increase productivity, J.B. Steel is building the towers on the ground in six sections each weighing up to 45,000 lbs. Once these sections are assembled, they are being lifted into their final location on the tower with a 280 ton crane.